Every time Stephanie Paquin listens to her 2-year-old foster dog struggle to breathe, she wants to cry. 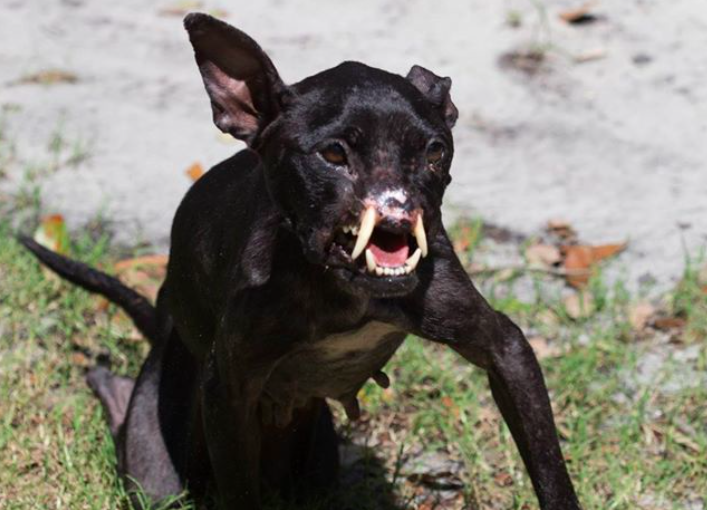 The abused pit bull without a nose was rescued by Paquin after only spending 36 hours in a Florida animal shelter. Her face has been so damaged that her upper fangs look like a bull's tusk. The shelter manager at Orange County Animal Services in St. Petersburg, Fla., called her "a special case." Paquin, founder of non-profit Passion 4 Pits, agrees that the dog named Khaleesi is a "special case," but not for the reason you may think. "She has this spirit -- she does not hold anything against anyone," Paquin told CBS News, explaining that the pup was most likely used as a bait dog or abused over the course of her short life. "I've never seen a dog so willing to let go of everything she's been through and trust anyone who comes up to her." The dog's "happy as can be" behavior is unusual, given all that she's been through. Last week, the dog was picked up by animal control after being suspiciously dumped in a yard in Orlando, Florida. The 20-pound dog is missing her nasal cavity, has a broken jaw and can hardly walk. "She has been severely abused, systematically over a period of time," Paquin said, referencing X-rays which have shown the dog once had a broken back, pelvis and rib fractures and damage to her legs from blunt force. When Paquin shared the dog's sad story on her Facebook page, she didn't expect thousands of people to actually listen. Khaleesi's photo quickly spread across the Internet, receiving nearly 10,000 likes and 4,000 shares. The number of people who followed her page quadrupled -- from 3,500 to more than 12,000. Hundreds of people thanked Paquin for saving her. "Thank you for seeing the beautiful life worth saving in this little girl," one user said. "Better days ahead little one," another commented. Within the past week in Paquin's care, the dog has already seen two different veterinarians, three different times. "We're looking at half a dozen surgeries," Paquin explained. "At least half a dozen surgeries to get her comfortable again." With more than $20,000 in donations, Paquin's wish may come true. Instead of talking about her face, Paquin wants people to talk about how loving and sweet she is. "She's like a blank slate -- she doesn't think about what happened," she said. "I want people to meet her and understand she's forgiving and loving, not dangerous." One day, Khaleesi will hopefully find a forever home. Until then, she's content cuddling with Paquin's two dogs, sharing toys and sleeping "like a rock."